Meyer lemons are in season! These beautiful fruits are mostly grown on backyard trees, but their rising popularity in recent years means they can often be found at farmers' markets in warm climates, as well as at natural foods stores and supermarkets around the country. Meyer lemons are sweeter, less acidic, and have thinner skins than regular lemons. 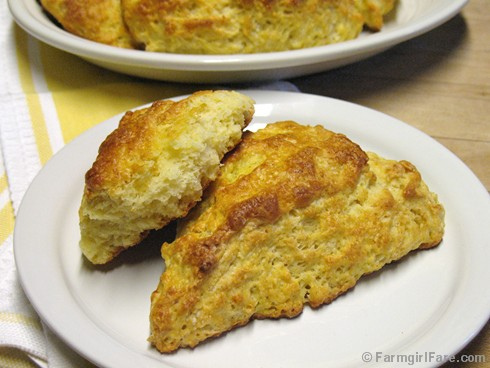 They also have a wonderful floral scent—and make delicious scones. This recipe is a variation of the traditional currant scones I used to sell at the little bakery cafe I had in my previous California life, back before I moved to the wilds of Missouri and became an enthusiastic but clueless farmgirl. They taste great plain, but you can fancy them up by adding currants or raisins and/or sprinkling coarse sugar on the tops. Butter, berry jam, and a proper pot of your favorite English tea are optional. I recommend serving them warm. If you can't get your hands on any Meyer lemons, these scones—which freeze beautifully—are still very nice when made with regular old lemons instead. Can't survive on scones alone? You'll find links to all my sweet and savory Less Fuss, More Flavor recipes in the Farmgirl Fare Recipe Index. Wanted to let you know that I made your Roasted Brussels Sprouts again last night and I love them so much that I mentioned them on my blog today with a link back to your recipe! Never having been to California, I had never heard of Meyer lemons until I read about them here. Then wouldn't you know it, they turned up in my mid-Canadian grocery store! I don't know if I just never noticed them before, or if they only just got popular enough to make it up here. So I bought some. I didn't make scones, but I have been having slices in my drinks, and today I made roast chicken stuffed with Meyer lemons and rosemary. YUM! Thanks Susan for the hot tip!